Sometimes you have more cabbages that you know what to do with, yet a month later they’re all gone and there’s a ‘hungry gap’ with no or very little veggies ready to eat. With this in mind, I’ve been looking into ways to preserve veggies to spread out the food we are growing more evenly through the year. Sure we could just freeze things, but I wanted to try something a bit more exciting that just whacking them in the freezer! Last weekend I went along to the “Viva la Ferment Fever” workshop run by Very Edible Gardens (VEG) here in Melbourne , which promised to cover the ins an outs of making sauerkraut and kimchi (fermented vegetables), yoghurt and kefir (fermented milk or non-dairy milk products). The workshop was jam-packed from start to finish, so I will talk here just about the sauerkraut and kimchi, then will talk a bit about yoghurt and kefir in my next post – information overload! The workshop was very intimate with just a small group, which was great as we could all gather easily around the kitchen table and get stuck in, everyone had a chance to get some proper experience and learn how to make the veggie ferments. With such a small group it had a very laid back atmosphere and was easy for everyone to ask questions (even for shy people like me!). We started by learning a bit about how lacto-fermentation works. The idea is to submerge the vegetables in (slightly salted) water, effectively sealing them off to prevent organisms from the air getting into contact with the vegetables. As well as preventing contamination and spoilage from outside organisms, being immersed in water also creates the ideal anaerobic (without oxygen) conditions for the natural organisms that normally lie dormant on the surface of the vegetables to start growing – providing the powerhouse behind the fermentation process. The word Sauerkraut literally means “sour cabbage”. Sounds delicious doesn’t it? It is actually quite tasty, it has a sour and tangy flavour that goes really well as a side dish with other foods. It is also really simple to make. 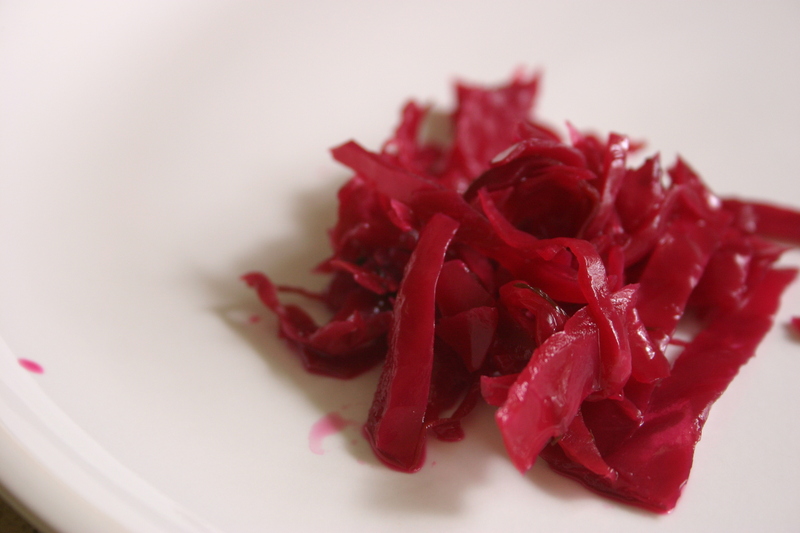 The main ingredient is cabbage (the clue’s in the name…), we used a red cabbage which looked great with its rich purple colour. In addition to the salt, other seasonings such as chopped dill or caraway seeds can also be added. – we added dill. Kimchi originates from Asian cuisine and often contains other vegetables (we used Chinese/wombok cabbage, daikon radish, leeks and carrots), along with garlic, ginger and red chilli. We started by chopping the vegetables into fine strips, putting some into a wide bowl and adding a small amount of salt – maybe ¼ teaspoon, just enough to taste. Carey explained that although you can do the fermentation without, adding salt helps to draw water out of the vegetables. By gently pounding the vegetables with the bottom of a glass bottle (carefully!) or by squashing the more tender wombok cabbage gently with our hands, we can help to break up the cell structure of the veg slightly to allow some of the water to come out. The vegetables don’t need to be beaten to a pulp, as you still want them to be a bit crunchy and maintain their shape after fermentation. We then packed a layer abo ut 5cm thick into the bottom of a large jar, and used the vegetable compression device (aka bottle of balsamic vinegar) to squash the vegetables down and pack them tightly into the bottom of the jar. The rest of the veg was packed in layer by layer, squashing each one down as we went. Interestingly, we could see the water starting to come out of the cabbage as it was packed into the jar, so that by the time it was full there was almost enough liquid to cover the veg when it was weighed down with the bottle. We each took some samples home so we could see how the fermentation went. I couldn’t find any nice neat little jars that would fit inside the jars to squash down the cabbage, so had to use beer bottles filled with water! I popped a little bit of cling film over the top to prevent the cats from sticking their noses in and also to stop the water in the beer bottles from evaporating or spilling. To begin with there wasn’t really much water, especially in the red cabbage sauerkraut, and I was worried it might start to spoil. But I followed Carey’s instructions and left it with the beer bottle weighing it down, and the next day there was more water. Within a day or two the cabbage was completely covered! The fermentation would take a week or two, but Carey advised that we should try some every couple of days to see how the flavours changed and see how we liked it. Once it had got to the point at which we felt the flavour was right, we could put it in the fridge to stop or slow down the fermentation. I tried each of our ferments after a couple of days. The kimchi was pretty good, you could really taste the ginger and chilli. The sauerkraut tasted quite cabbage-y! Surprising, that. I’ve tried them a couple of times since and the sauerkraut is pretty good now, it tastes a lot less of just cabbage and is a bit more sour and interesting. A great joint effort from all of us at the workshop – I’m interested to see how it goes making it from scratch on my own! Overall it was definitely a worthwhile use of a Saturday morning, and I will be making more and trying out some of the other recipes for sure. A big thanks to Carey and Cassie at VEG for making it such a great workshop, and watch this space for Episode 2 – Adventures in fermented (non)dairy! 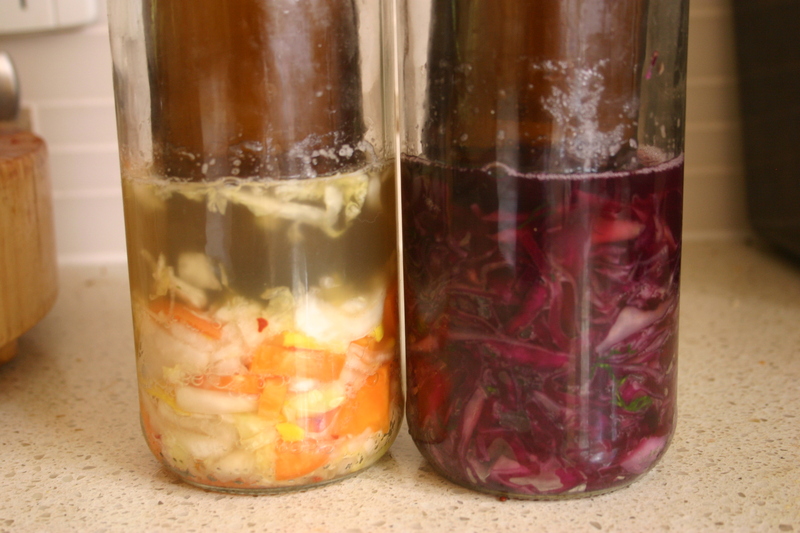 This entry was posted in fermentation, in the kitchen and tagged cooking, fermentation, sustainable living, workshop. Bookmark the permalink.